Comments: Standards are recommendations only. Compatibility of the standards in the user developed application needs to be established and confirmed by the researcher. Small volumes of DAD1 recombinant protein vial(s) may occasionally become entrapped in the seal of the product vial during shipment and storage. If necessary, briefly centrifuge the vial on a tabletop centrifuge to dislodge any liquid in the container`s cap. Certain products may require to ship with dry ice and additional dry ice fee may apply. Essential subunit of the N-oligosaccharyl transferase (OST) complex which catalyzes the transfer of a high mannose oligosaccharide from a lipid-linked oligosaccharide donor to an asparagine residue within an Asn-X-Ser/Thr consensus motif in nascent polypeptide chains. N-glycosylation occurs cotranslationally and the complex associates with the Sec61 complex at the channel-forming translocon complex that mediates protein translocation across the endoplasmic reticulum (ER). Loss of the DAD1 protein triggers apoptosis. NCBI/Uniprot data below describe general gene information for DAD1. It may not necessarily be applicable to this product. 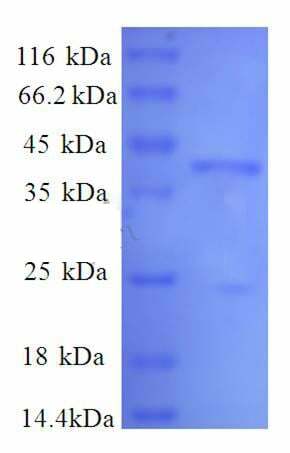 DAD1: Component of the N-oligosaccharyl transferase enzyme which catalyzes the transfer of a high mannose oligosaccharide from a lipid-linked oligosaccharide donor to an asparagine residue within an Asn-X-Ser/Thr consensus motif in nascent polypeptide chains. N-glycosylation occurs cotranslationally and the complex associates with the Sec61 complex at the channel-forming translocon complex that mediates protein translocation across the endoplasmic reticulum (ER). Loss of the DAD1 protein triggers apoptosis. Belongs to the DAD/OST2 family. 1. single-nucleotide polymorphisms in DAD1 gene is associated with neuroendocrine tumor.